Random weirdo callers mixed into electronic dance music. 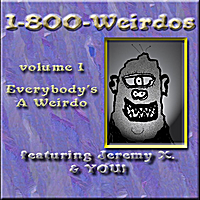 Mysterious and eclectic, the 1-800-Weirdos CD will infect your brain with with bizarre beats and strange synth sounds. Like the Jerky Boys in reverse, crank callers to our phone line are syncronized to the trippy musical material, with drum beats morphing into spacey atmospheric shimmering. All of the vocals on the CD are taken from actual callers to 1-800-Weirdos. Call 1-800-Weirdos (800-934-7367) right now and you may find yourself on Volume II!